A. 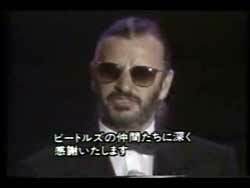 Title: World Music Awards 1989. Location: Monaco. Country: Principauté de Monaco. Date: Friday 14 April 1989. Aired: Saturday 20 May 1989. 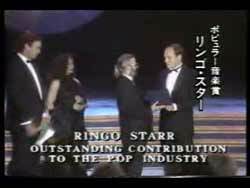 Ringo receives an award for Outstanding Contribution to the Pop Industry from Bianca Jagger. The Beatles on DVD © 2017 Bamiyan. Last revised on 6 November 2011.